Home » VectorVest » Reiterate buy Speedy Hire #SDY says VectorVest. Solid results & bullish technical picture warrant a revisit to the investment case. 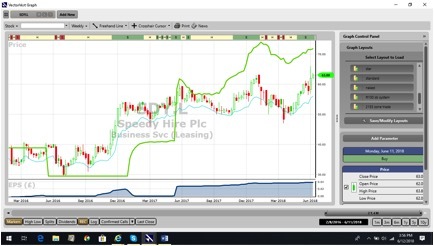 Reiterate buy Speedy Hire #SDY says VectorVest. Solid results & bullish technical picture warrant a revisit to the investment case. By Alan Green in VectorVest on 13th June 2018 . Newton-le-Willows based Speedy Hire (SDY.L) was founded in 1977, and provides tool and equipment hire services to construction, manufacturing, industrial, and related industries. It offers a range of tool and equipment for hire, which include access towers, light plant, fencing, heating and cooling equipment, portable accommodation, pumps, generators and compressors, lifting equipment, safety equipment, rail equipment, heavy duty hammer drill, headroom hoist, and power pipe cutter, as well as instruments for surveying, civil engineering, and construction applications. SDY provides various asset services, including product specialization, testing and inspection, fuel management, survey service centre, on-sites, and hire direct, as well as a range of advisory services. It operates from over 200 depots across the UK and Ireland. On November 22nd2017, VectorVest published a buy note for Speedy Hire at 55p, noting that the stock first flagged across key metrics as far back as November 2016. View that article here. Shares moved higher, hitting our then 64.1p target intraday during mid December before falling back during March. Following a solid set of results in May, SDY shares continue to push higher backed by the VectorVest RT (Relative Timing) metric, a fast, smart, accurate indicator of a stock’s price trend. Today at 63p the SDY RT metric still logs a rating of 1.51, which is excellent on a scale of 0.00 – 2.00, while a GRT (Earnings Growth Rate) of 16% is still considered very good by VectorVest. Despite the push higher, VectorVest still sees more to come, and recommends a price target of 71.7p. The weekly chart of SDY is shown above over the past two years. The share appreciated strongly in the period of June 2016 to June 2017. Since this time the share has charted a double bottom pattern which after a strong move upwards is a strong technical signal. The first technical target from the double bottom is approximately 75p which is similar to the VectorVest valuation. Summary: The VectorVest November note was very much based on the strong set of half-year results. SDY followed that with another solid set of FY results, so it was entirely logical that VectorVest should revisit the investment opportunity. Both RT and GRT metrics are indicating there is more to come, and this backed by the 65% increase in the FY dividend is once again a clear and confident signal from the SDY board of more growth to come. As such VectorVest reiterates a buy rating for SDY. Readers can examine trading opportunities on SDY and a host of other similar stocks for a single payment of £5.95. This gives access to the VectorVest Risk Free 30-day trial, where members enjoy unlimited access to VectorVest UK & U.S., plus VectorVest University for on-demand strategies and training. Link here to view.